Ponferrada to Villafranca del Bierzo. Our fears of a noisy night were unfounded, we slept well and with a 0600 start we were soon wandering in the dark out of Ponferrada and along the road westwards. We now have less than 200km to go to Santiago de Compostella. Dawn found us in another wine growing region (well all that Spanish wine must come from somewhere) with rolling hills and dry grasses alternating with vineyards. One interesting sight in one village was an 18th century wine press made from a whole tree trunk and a few other bits and pieces. Wine has been made and drunk here for a long time. We only walked 22km today because tomorrow is an ascent of 800m after a 25km march and we are not in a hurry to reach Compostella as our ladies will not arrive till Monday evening a week from tomorrow. We have now been on the road almost 4 months and it seems a lifetime, but home is getting closer, our legs could really do with some time off so we are glad we need a slower pace. The municipal albergue in Villafranca has a usable WiFi connection so this post should not be subject to the vagaries of the connection via Tony’s super phone, while this has served well it has often taken multiple attempts with Tony disappearing up hillsides to get a good data signal and it seems telecom companies just don’t expect people to upload data in the middle of nowhere. Villafranca is quite a large place and having arrived early with washing done we wandered down the hill into the narrow streets finding a restaurant and joining a rapidly growing crowd of locals in the bar waiting for the back room lights to go on, like greyhounds out of a trap we all surged forward into tables and a well trained cadre of staff rapidly took orders and served food, relatively expensive 13€ for 3 courses, inc wine and water. The restored but very old church 50m from the albergue is where in the 13 and 14th centuries pilgrims too sick or injured to continue were taken to receive their indulgences as if they had been to Compostella. The local storks have now ceased to nest on church towers but are instead using large industrial chimneys as well as high voltage electricity pylons. We descended from our mountain village 600m in the course of the morning. We had carefully considered our options for today as spending Saturday night in a large town again was not on our list of priorities. However the options for accommodation in a reasonable distance past Ponferrada, plus the fact that we now have a date (Sept 1st), for arrival in Compostella and have time in hand, combine to persuade us that the charms of Ponferrada are worth the possibility of a night of inadequate sleep. The aubergue it turns out is on the outskirts of town and the dormitories are for four persons so we should be alright here. A slight worry that assails us is the passing of three memorial plaques to dead pilgrims who having got this far unfortunately got no further. One a cyclist from Germany (to whom there is a cycle shaped memorial in El Acebo), another an elderly man from (forgot where) and finally in the garden of the albergue a Finn. We hope that this is just statistics as we approach the most frequently walked part of the Camino. During the walk down we met two Scots in kilts coming in the opposite direction, one walking down from north to south the length of Spain for an Amyloidosis charity (see www.caminocontrolaamiloidosis.blogspot.com), the other with him as support for a few days. We wished them luck and narrowly avoid an international incident when two Austrians we met earlier as if they can photograph the English. He was very restrained only muttering ‘I’m not English’. The albergue is closed until 1300 and it is 1130 when we arrive as we only walked 16km with a late start, so we leave our rucksacks and go into to town to visit the castle. This was originally built by the knights Templar in the 13th century as a stronghold from which to rid the surrounding countryside of bandits preying on pilgrims. It was taken over by local nobility when they fell out of favour with the Catholic church internationally in the 14th century. It has been extensively restored but in a sensitive manor and provides a strong contrast with the new city of high rise blocks on the other side of the river that forms part of its natural defences. We check in to the hostel, which is manned by volunteers and accepts donations not charging a fee and after lunch are pleased to see the Hungarian girl we left behind some days ago. She had a day off not feeling well and has caught up with us on our first small day since then. We have always had great respect for her walking abilities. Ponferrada is so named is there was an iron bridge built here at the end of the 12th Century. Don’t know if it still exists in any guise as we haven’t been able to find it. We are currently about 200 kilometres from Compostella. Maybe. Every guidebook, leaflet or other literature seems to give different distances. This is some extent because the route has been changed innumerable times over the years and thus the distance from any point has changed with it. A large number of bars have a sign outside telling the poor pilgrim how many more kilometres they need to walk. These signs are sponsored by Mahou beer, so this obviously must be the pilgrim’s choice of refreshment. Astorga to El Acebo via Foncebadon and the Iron Cross. First some more about Astorga which we left at 0600 this morning leaving Ray and Richard sleeping to catch a train later. This town is important as well as being a nice sized city with a number of good albergues, it was the crossroads of two or more important Roman roads. Remains of Roman buildings are still being excavated with plans to incorporate them into the new roads and paths in the city. Napoleon captured the city in 1809 and the recapture by Wellington and some Spanish forces is commemorated in a large symbolic statue of a lion killing an Imperial Eagle. It is of course the Diocesan centre and the Bishops Palace is a beautiful building designed by Gaudi in the late 19th century. It houses a gallery of 3 floors of (mainly ) religious art which we went round, along with a basement of roman artefacts, although the building itself tends to overshadow the contents. The cathedral and its own museum may well be worth seeing but we were rather overloaded by then and only looked at the outside. As soon as it was light we could see the Montes de Leon, the mountains between us and the next major town of Ponferrada and at 1530metres the highest point on the Camino. We climbed steadily but not steeply over 20km and after passing the hamlet of Foncebadon (permanent population 7 people) with two albergues we reached on the col a large iron cross surrounded by a pile of stones. The cross is not original it was overwhelmed by the load of stones dumped on it by past pilgrims eager to symbolically get rid of their sins in the form of rocks carried on their journey. We saw the original in the museum in Astorga. Nonetheless the new pile seems larger than the picture in our book and we duly added to it our stones carried from England, and three for Richard from his family in France. Tim’s stone was excavated by the badgers in his garden, and Tony’s was a piece of Mendip limestone. We were then intending to stay in a small albergue 2-3km down from the col at Manjarin (permanent pop 2!). This was described in our guidebook as being ‘extremely spartan’ and this did indeed prove to be the case. We found a fairly ramshackle building with a lean-to outside containing religious bits and pieces for sale being serenaded to religious music which may have been provided by ‘Radio Maria’. This transmits locally on 101.3 on FM and is widely advertised with the picture of a photogenic nun. Luckily we do not have a radio with us so we have not been tempted to listen. Despite our feet being tired, we decided that this was probably not the right stopping place for us, so be continued on another 7km to El Acebo where we found lodgings in a very nice albergue and restaurant. Villadangos dal Paramo to Astorga. Hurray! Hurray! The end of the ‘bleak plateau’. The day began as many at 0530 in the dark along a main road out of town, flat and tedious with wincing from those in the party with problems in the foot department. It was light before we reached our first stop, the bridge over the river Orbigo. This magnificent structure of 19 arches covering the western flood plain as well as the river at this time of year is the longest bridge on the Camino. Reputedly the site of a month long jousting tournament in 1434 and by the standards of the time was a huge event ‘breaking 300 lances and leaving one combatant dead’. The winners clubbed together and bought a necklace of gold that supposedly still adorns a statue of St James in Compostella, we shall soon see. From our perspective there was breakfast at the far end. We left Richard to complete this section at his own pace, his legs still giving some trouble but improving after anti-inflammatories and massage by Tim. Ray has recovered and was as sprightly as an antelope as we topped the rise at the cross of Santo Toribio to overlook not only the small basin of the river Luerto in which lies Astorga but also a view of the mountains of Galicia having completed 30km in 6 hours. Astorga is a nice sized city being large enough for reasonable shops but without a huge suburb to walk through. The municipal albergue is excellent and we have a four bed room to ourselves that we share with Richard when he arrives about 45mins later. He is in reasonable shape but intends to finish his pilgrimage next year, and so he and Ray will return to the real world tomorrow while we continue in our trance like state towards Santiago and our final destination at the end of the world. Ray’s bit When 5.30 am comes around and we say au revoir to nos copains de la camino, it will be with some regret that we will not be going up into the hills but instead going back to bed for a later breakfast but heh that’s life. It has been great to be part of the trip and have a few stamps in my pilgrim passport but ultimately its not some thing I feel the need to do, although I can see the daily routine has a seductive quality all of it’s own. Buen Camino! Leon to Villadangos del Paramo. Richard rises this morning to discover flea bites on both of his shoulders. We assume that he has received these from his pillow overnight and inform the albergue guardian. He takes this very seriously and says that the whole room will be fumigated asap. If they don’t deal with problems like this then it spreads like wildfire up the camino. He shows us a newspaper article about another albergue that had to be closed down completely when it became infested. The Paramo bit of the name today means the ‘bleak plain’. We can tell from this that the day will be much as the previous, it is. We decide since both Richard and Ray will not make it to Compostella this year that in view of their difficulties and our aim to arrive on the same day as our good ladies, that an easy day of 24km is reasonable. We complete some of the most boring walking we have yet done along the main road to Astorgas by 1130 and check into the Municipal albergue with some relief. Progress was only made possible by chatting and trying to learn some more French from Richard. Washing done we wander round the village dodging lorries on the main road and visit the little church dedicated to St James. It has an altar piece featuring him in his incarnation as the Matamoros (moor-slayer). We have lunch and retire for siesta as there is nothing else to see or do. Another day of this to Astorga and the topography at least becomes more interesting. Santiago ac iechyd da I bawb. El Burgo Raniero to Leon. After a good night rest at the municipal Albergue in El Burgo, run by volunteers German and Spanish, we are off and away at 0530. The moon is still giving good light and the route is obvious alongside the road for many kilometres. The day dawns on flat stubble fields (what a surprise), but we have seen the lights of Leon in the far distance and although we have said we will stop and discuss whether to continue the full 36km to Leon none of the towns we pass through seem particularly appealing except as coffee stops so we press on. Richard our adopted Frenchman is going well today and soon will have to decide whether to continue with us and return next year to finish the Camino or press on even harder to reach Compostella three days before us so he can return to work. There are many trees in les Sables d’Olonne awaiting surgery. This distance covered in seven and a half hours may not have been good for Ray. Although fit for running he behaved today like one of the toy rabbits in the Duracell advert (the one with the ordinary battery). We check into the municipal albergue by the river it is a bit faceless but cheap, clean and comfortable. Ray declines to walk around Leon after lunch, and misses a really nice little city with a cathedral as impressive though less opulent than Burgos. Back at the hostel Ray is recovered and seems happy with a plan for a definite “only 24km tomorrow”. Ray’s bit,Yes it cannot be denied as the final stages into Leon down a never ending road I got slower and slower and slower…..This pilgrim business is harder than it looks with the others loping around like greyhounds on a leash, 1000 or so miles has honed them into walkers with attitude,still its another day tomorrow I cant wait for 5 am. Terradillos de los Templarios to El Burgo Ranero. Another day another dollar, more strolling (marching!—ray) across the plains of Castille y Leon. Ray seems to have survived his first day on the Camino, he has ended up doing the stretch that many avoid by the bus from Burgos to Leon. Today was another day of flatlands with distant mountains getting no larger or smaller. The route largely follows the road which follows the original roman route across the plains. We make our way in the dark out of the albergue which was very good with beds instead of bunks and only six people in our dormitory, even so there is always one with a head torch who takes for ever to go to bed and wants to get up before the rest. Such minor grievances can assume large proportions in the middle of nowhere. There is a nearly full moon so head torches are not needed and the temperature is perfect for walking in the moonlight. No problems this morning with finding yellow arrows and scallop shells. We later see a T-shirt (black with a single yellow arrow) simple but you need to have been here to appreciate it. We stop for the usual café con leche and one of the big croissants they make here. Later we tease Richard our French companion about the size of French croissant compared with the Spanish and he takes it in good part. It is quite remarkable how patience and effort can replace fluency in language even for quite complex concepts, we are definitely into post doc levels of “point and grunt”. Just before Sagagun we leave Palencia and move into Leon. Only 365 to go to Compostella! There is really little to report, after 32 km and 6 hours, we reach El Burgo. This is a two horse town with a good albergue run by a German volunteer and his Spanish colleague with a good restaurant opposite. After lunch and siesta we shop for some food for evening meal and breakfast in the tiny general store down the street. Like Terradillos many of the houses here are adobe (mud and straw), straw being plentiful as a building material. Even those made recently of more modern bricks than mud are rendered with a mix of mud and straw. We think this improves insulation, not only against the heat but also in winter from temperatures as low as minus 10degC with snow, as we learnt yesterday from one of the friendly locals in Terradillos. Two more days of the flat plains and there may be some more interesting terrain for Ray, but this is the real Camino. Carrion de los Condes to Terradillos de los Templarios. In the albergue, we meet a French lady from Auch. When we tell her that we passed through there on the 17th July then she says that she saw us, waved at us and tooted her car horn as she always does to pilgrims she sees. What a small world. In the evening the nuns organised a meal. They provide soup and everyone who wished could bring some food to be shared. About three quarters of those in the hostel including ourselves with Ray who arrived by taxi from Fromista, attended. They then sang, gave us each a present (a star to remind us of our visit to the Albergue), blessed us and wished us well for the rest of our pilgrimage to the tomb of St James. Even if you are non religious then it was an excellent end to a fine evening. There was rain in the evening and more in the night. Thankfully the nuns had brought in everyone’s washing while we were out walking around the town. We slept well and started at 0600 with breakfast, coffee and a big chocolate roll in the bar just down the street. The early light at about 0730 found us marching like legionaries along the route of the Via Aquijana a Roman road to Gallicia. The Roman military engineers had no problems with the terrain forcing changes in direction and we must have walked for over 10km in a straight line. The only change in the landscape being a slight bump as we crossed the only contour line between Carrion and Terradillos. The only entertainment being the frequent shotgun reports from the field on each side from the hunters of what we think are quail, small brown birds that scurry round in the stubble fields. There seems to be little else to do on a Sunday in Palencia. Every now and then a group of four wheel drive vehicles appear parked in the distance and as we slowly approach the trailers behind them turn out to be portable dog kennels for the hunting dogs. These and the very infrequent picnic areas at the side are the only indication of forward progress. We thought we were on the plains yesterday but this is the real place. We pass one small village with a hostel and stop for coffee after another hour. We top a very minimal rise in level (about 10m) and suddenly the village of Terradillos appears. It has one church, two albergues and took all of 10 minutes to explore completely! As a new arrival to the pilgrim (pelegrino) life style I seemed to have survived the first day, walking in the early hours and resting in the heat with vino (2.50 euros a pitcher), and think I could get to like this---how far do we have to walk tomorrow and what time do we start! Already Wales seems along way away and it is of course after a 30 hour train journey across Europe to get to the middle of nowhere( from the middle of nowhere some might say) allons y mes amis! Fromista to Carrion de los Condes. Breakfast as promised starting at 0600 in the albergue which gets us off to a fine start in the dark at 0630. There are the usual new road junctions with few signs to be negotiated but soon we pick up the old camino along the tarmac roadside, it is as straight as a roman road across the plains and waymarks are not needed but they are there in a superabundance. The light remains dim as there is thick cloud and soon it starts to rain heavily enough even for us northern Europeans to put on waterproofs. There is a fresh damp smell in the air although even the fairly heavy rain does little more than moisten the parched ground. We see few other pilgrims even when we stop and there are few when we arrive in Carrion and we suspect they are waiting for the rain to stop. We pass through a number of small villages but nowhere is open to sell us a cup of coffee (or anything stronger). It must be said that by any standards the walk today is boring, there is little change in height (me are hovering around the 800 metres mark which explains to some extent the low temperature) or direction and the stubble fields stretch for miles. The small flowers at the roadside are still blooming and every now and then a lark sits on the path until we approach then flies on a few yards. A flight of four storks passing over is a major occurrence (repeated again in Carrion with a flypast of 5! ), but the going is very easy and the kilometres click by with a small part rainbow appearing as we approach Carrion. This town surprisingly is significantly larger than Fromista, it has three main churches, dozens of bars and shops. We walk around in the late morning and eventually stop at one of the three albergues to wait for opening at 1200 where we are greeted by a lay helper who speaks excellent English and two nuns. It is modern and spotless, and once again our extensive pages of place stamps starting in England provoke admiration. The Camino now is often done in pieces as many do not have time to walk the whole distance from home where ever that is, and those walking the way from their homes as in medieval times are relatively uncommon. We meet the French tree surgeon whom we first encountered two days ago. He speaks nothing but French but seems happy to allow two English to mangle his mother tongue. We have a good lunch together and a surprising amount of communication occurs, although sophisticated concepts are beyond us all. We did find another albergue that calls itself such but has a sign saying youth hostel no pilgrims in several languages. We think it may be a hostel for Spanish youth groups as there is an amount of non alberge accommodation in town though a lot seems to be full. There is a steady stream of pilgrims entering the hostel during the afternoon as they complete their walk for the day and the weather has brightened considerably. We talk to the English speaking lay helper about Ray who will be arriving to walk with us today and are reassured that they will not turn him away even if there is no bed. We have mats so he will be fine on the floor! We plan to meet Ray, who is coming to walk with us for a while, tomorrow in Fromista. The albergue offers breakfast from 0600 and a short day of 22km is planned. In spite of this we are off at 0630 in the dark, It’s cold! This is Spain? Yes but we are at 3,000ft. We have on fleeces and soon stop to fumble in rucksacks for gloves. Head torches are only needed for a short time and no deviations from the route are experienced, once is enough we are more careful now. In spite of this we do not see sunshine till around 1000 due to a combination of eastern hills and some early low cloud behind us so it stays cool and we walk faster than planned. We walk down the valley and along a metalled road for a while it passes through the ruins of the monastery of the order of St Anton there are niches in the ancient walls where bread was left for pilgrims, a closed order whose blessing was supposed to heal the medieval gangrene of St Anton’s Fire (don’t know what this was but it sounds unpleasant). 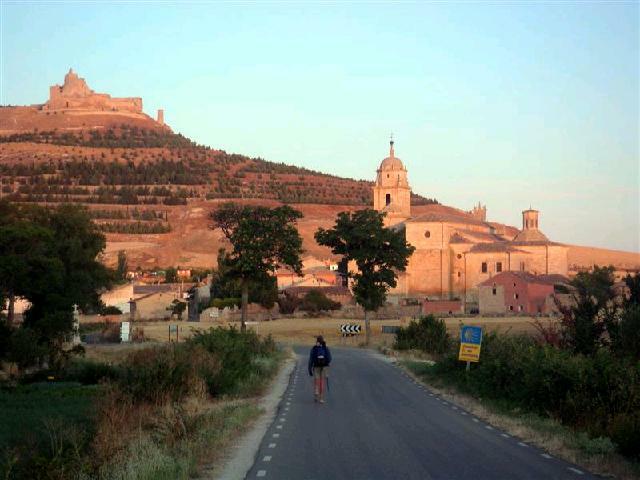 As we approach Castrojeriz the sun starts to appear, lighting the ruins on the hill first and then creeping down to the church at the start of the town that is strung along the bottom of the hill. We climb a steep escarpment and look back at the rising sun, and then soon descent towards a field of sunflowers standing out among the harvested fields of grain. To the north we can see mountains along way across the flat plains, they are the Cordillera Cantabrica and the Picos de Europa about 70 miles away. The way seems to go on forever with stubble stretching across to a host of wind turbines, reminders of Don Quixote and his travels around this region. We eventually reach the Rio Pisuerga and the border of the Province of Palencia where a Spanish pilgrim asks us to take his photo by the border sign. He seems very pleased, but we don’t know why. Suddenly we climb a bank of about 10feet and are on a canal tow path. It is just like the first day of Tim’s walk from home in England. We said earlier that the word canal in Spanish on our maps meant valley. We were wrong as it does mean canal, although mainly for irrigation purposes and indeed some of them are underground explaining our confusion. This one is the Canal Castilla and we follow its green contrast through the yellow fields to Fromista. From here south it appears to be navigable (or at least has been in the past), as a flight of decommissioned lock gates drop the canal 50 feet or so into the valley. Once again we walked too fast and failed to stop as planned at our original destination. At 1230 we have walked 34km. Ray will have to follow tomorrow when he arrives in Fromista. Just outside the Aubergue there is the 11th century church of San Marin which is undergoing restoration. Under the eaves are a frieze of 315 carved animals, humans, flowers and monsters. These are in excellent condition after 1000 years and quite rightly the building is now a national monument. One of the other churches in town has nesting on its roof 3 storks. Many churches and towers in the area appear to have storks nesting and they are obviously tolerated by the locals. It can be a bit disconcerting however when you hear a stork clacking its beak together some way above you when you are walking past.